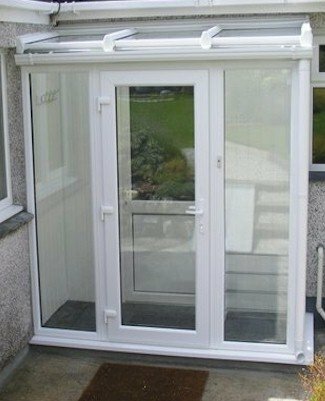 Porch kits with fully glazed full height panels, complete with a lean-to roof and a single door. 2.0m wide x 1.0m projection Lean To Porch. With full height, fully glazed panels. As standard you will receive a variable pitch roof to support polycarbonate or glass. 150mm wide cill. Quality door furniture including hinges, lever/lever door handle, lock & key. (Letter box can not be fitted ..
2.0m wide x 1.5m projection Lean To Porch. With full height, fully glazed panels. As standard you will receive a variable pitch roof to support polycarbonate or glass. 150mm wide cill. Quality door furniture including hinges, lever/lever door handle, lock & key. (Letter box can not be fitted ..
2.0m wide x 2.0m projection Lean To Porch. With full height, fully glazed panels. As standard you will receive a variable pitch roof to support polycarbonate or glass. 150mm wide cill. Quality door furniture including hinges, lever/lever door handle, lock & key. (Letter box can not be fitted ..
2.5m wide x 1.0m projection Lean To Porch. With full height, fully glazed panels. As standard you will receive a variable pitch roof to support polycarbonate or glass. 150mm wide cill. Quality door furniture including hinges, lever/lever door handle, lock & key. (Letter box can not be fitted ..
2.5m wide x 1.5m projection Lean To Porch. With full height, fully glazed panels. As standard you will receive a variable pitch roof to support polycarbonate or glass. 150mm wide cill. Quality door furniture including hinges, lever/lever door handle, lock & key. (Letter box can not be fitted ..
2.5m wide x 2.0m projection Lean To Porch. With full height, fully glazed panels. As standard you will receive a variable pitch roof to support polycarbonate or glass. 150mm wide cill. Quality door furniture including hinges, lever/lever door handle, lock & key. (Letter box can not be fitted ..
2.5m wide x 2.5m projection Lean To Porch. With full height, fully glazed panels. As standard you will receive a variable pitch roof to support polycarbonate or glass. 150mm wide cill. Quality door furniture including hinges, lever/lever door handle, lock & key. (Letter box can not be fitted ..
3.0m wide x 1.0m projection Lean To Porch. With full height, fully glazed panels. As standard you will receive a variable pitch roof to support polycarbonate or glass. 150mm wide cill. Quality door furniture including hinges, lever/lever door handle, lock & key. (Letter box can not be fitted ..
3.0m wide x 1.5m projection Lean To Porch. With full height, fully glazed panels. As standard you will receive a variable pitch roof to support polycarbonate or glass. 150mm wide cill. Quality door furniture including hinges, lever/lever door handle, lock & key. (Letter box can not be fitted ..
3.0m wide x 2.0m projection Lean To Porch. With full height, fully glazed panels. As standard you will receive a variable pitch roof to support polycarbonate or glass. 150mm wide cill. Quality door furniture including hinges, lever/lever door handle, lock & key. (Letter box can not be fitted ..
3.0m wide x 2.5m projection Lean To Porch. With full height, fully glazed panels. As standard you will receive a variable pitch roof to support polycarbonate or glass. 150mm wide cill. Quality door furniture including hinges, lever/lever door handle, lock & key. (Letter box can not be fitted ..